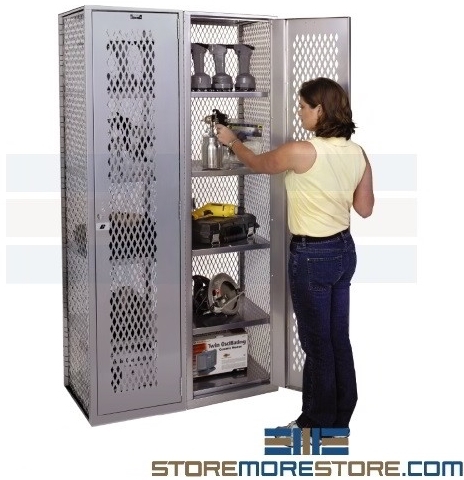 All welded mesh ventilated equipment lockers provide high visibility, ventilation, and security for whatever you store. The ventilated equipment lockers allow you to store industrial equipment, personal items, chemicals, parts, and more in a breathable, visible, and secure area. Easily keep track of your equipment, tools, chemicals, and more while still allowing them to remain securely stored in heavy-duty, rust-resistant all welded mesh ventilated equipment lockers. The diamond perforated pattern on all sides allows you to view the contents inside the locker and provide ventilation without sacrificing security. They are great choices for supply rooms since the lockers provide excellent ventilation to all stored contents. Lockers come with four fixed shelves that form five storage levels. A 14-gauge steel door is included and comes with a stiffener that helps prevent warping. 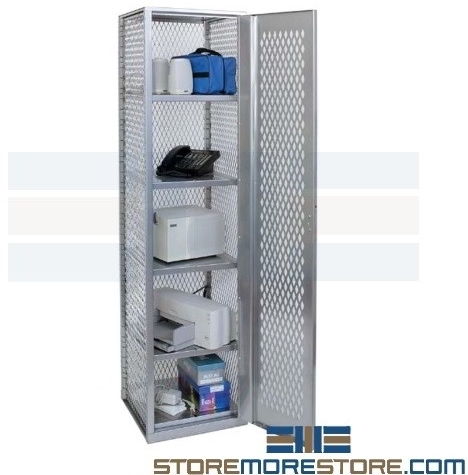 Mesh ventilated equipment lockers are available to buy online and are shipped fully assembled for easy installation. If you need assistance with anything, please call us at 1-855-786-7667.